So here we go! This may take a long while, but I'll try and do it all. Maybe I'll break it up into a few posts...but for now, the little worm is asleep on Rob's chest, so I will take this opportunity of freedom from being a feeding machine to tell you my story! So as you all know I went to the midwife on Tuesday to have a membrane sweep, and to check how I was doing 'down there'. The midwife was pleased as my cervix was quite thin and already about 1 cm dilated. When I got home I got my mucus plug, and carried on getting it all evening. My mum arrived on Tuesday afternoon, and I started to get crampy feelings in my stomach. I went to bed quite early as I had a feeling something might happen in the night. Rob and I watched some of Star Wars (the first movie) and I fell asleep. So about 5 in the morning I felt my waters break. It wasn't so much of a gush like it is on the tv, sort of a big trickle, sort of like wetting myself but it felt a bit different, from a different place. I phoned the assessment centre and they said to come in at 11 in the morning unless I started to get contractions less than 5 minutes apart or my waters had green or brown in them. They were clear when they broke. I kept on getting trickles every time I slightly moved, which was horrible. I thought when your waters broke, they just broke all of a sudden and that was it. But no, just a constant feeling of wetting myself. Lovely. I started to get contractions about 6 which were about 8-9 minutes apart, and lasting about a minute. I could easily breathe through these, and sort of dozed in between in bed. I had some toast about 7 in the morning, and finally got up about 8, as the need to walk around and be mobile took over. I had a little bounce on my gym ball. Things seem to slow up when I was lying down so I wanted to get things going again, plus the whole swaying thing really helped when I got the contractions. My Mum and Andy arrived about 9 in the morning, and helped us get everything ready to go to hospital. I got really emotional again, and just wanted to hug Rob all the time. I was still up until that point really scared of the change that was going to happen, and literally clinging onto the last of me and Rob together. We made a move to the hospital, and I said goodbye to our little flat and our old life. 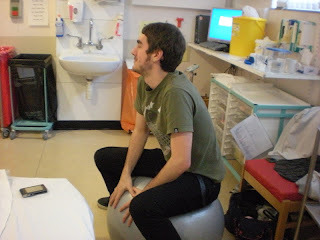 When we got to the assessment ward only Rob could be with me. 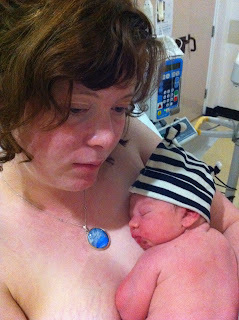 I noticed that my waters had gone slightly green, and when I had to show my pad to the midwives they confirmed that it was, and it was a sign that the baby had passed meconium inside of me. This wasn't because he was in distress, but most likely because he was 6 days over due. So I had to go on the monitor to see how his heartbeat was. His heartbeat was stable, and he seemed happy enough. Whilst we were on the ward a lady came into be assessed and we heard some groaning, followed by some screaming, then lots of running footsteps, and about 2 minutes later we heard a baby cry. She had come in and had her baby in about 5 minutes!! My contractions were getting stronger and slightly closer together, nearly 5 minutes apart, but they were quite irregular. I got up and walked around for a while, then put on my tens machine, which worked amazingly! 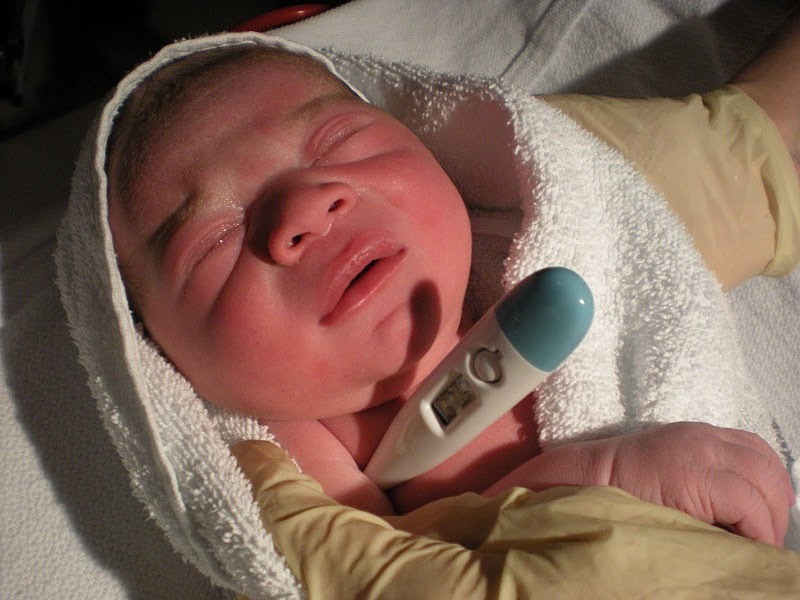 They examined me at 2pm and I was about 2-3 cm dilated, so they decided to send me to the delivery ward. This meant that my Mum could come in with me as well, which I was really happy about. It took me a while to walk over because my contractions were getting pretty painful and I had to stop and breathe through them. I had to be put on the monitor again when I got to my room, and everything was fine still. You can see my contractions were getting pretty regular on the monitor. After a while I needed to walk around again, the contractions were getting pretty painful, and I remember being really really scared about them getting worse. I just couldn't believe that I had to be in so much pain, and that it was only going to hurt more. At one point during a particularly painful one I had the sudden urge to throw up, so I was, in the sink. Just loads of water. I hadn't really eaten anything since the morning, other than a cereal bar and half a bag of mini cheddar's. They examined me again at about 4.45pm and I had only progressed to 3 cms. The midwife was concerned that I had been in labour for quite a long time, and things were moving really slowly, so they wanted to put me on the drip to speed up my contractions. 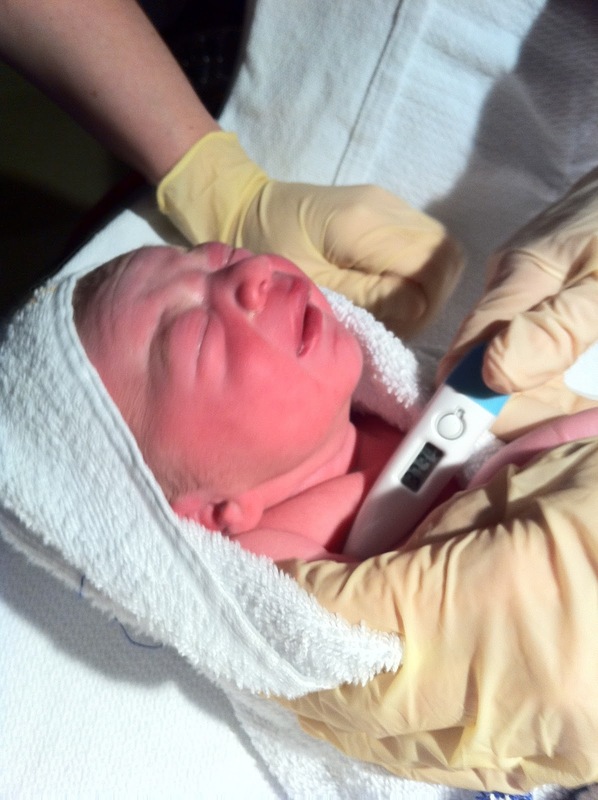 At this point I had only been using my tens machine for relief, and she suggested that I should have an epidural because when the drip kicks in the contractions get a lot stronger and intense in a very short space of time. 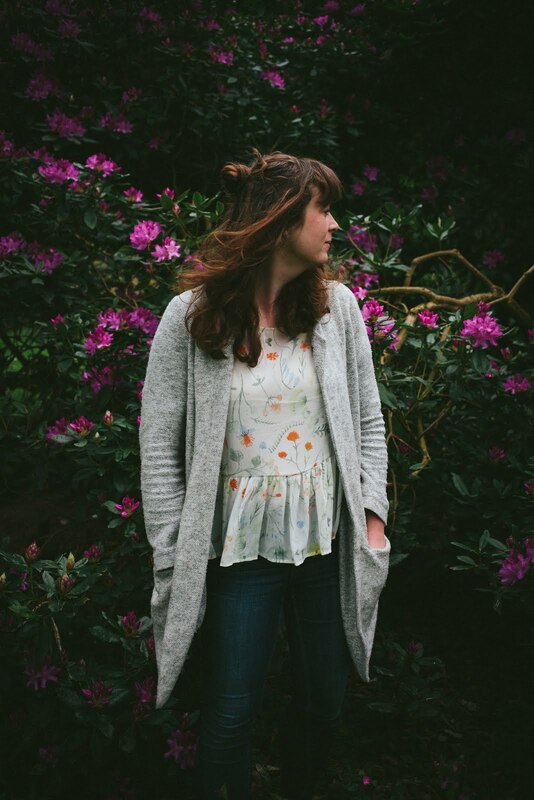 So I agreed to have the epidural, it wasn't in my birth plan, but by that point my birth plan had gone so far out the window I didn't care, and just didn't want to be in pain anymore. In fact as soon as I knew I was going to have an epidural I wanted it to happen straight away! I started to use gas and air which was really good at helping my breathing. I didn't go mad on it, mainly because my Mum was in control of it. I was only allowed 3 puffs every other contraction. It seems harsh, but actually worked really well! I hate seeing the women on One born every minute who go crazy on it and won't take it out of their mouths! At 6pm they put in the epidural, which didn't hurt really, I think I was just so happy to know the pain was going to stop soon. I really can't describe the pain of contractions, and now I can't really remember how they felt, but I know at the time they were the most painful thing in the world, and I knew I never wanted to go through that pain again. I said never ever again to having a baby! Now I'm not so sure!! It took a while for it to work, and I could still feel contractions, but they didn't really hurt anymore. 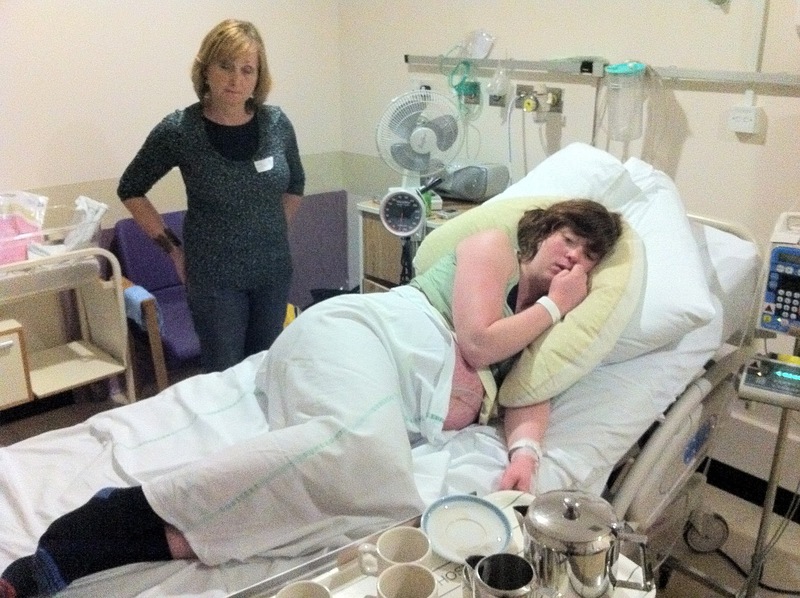 From then on I had to stay on the bed, and just chatted to Rob, my mum and the midwife. I think I even managed to have a little sleep which was amazing! 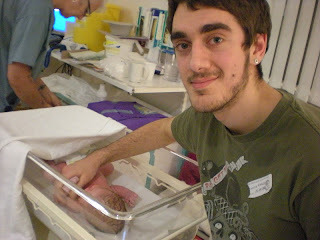 At the new midwifes came on shift, and I had a really nice lady called Bev, from Wales. 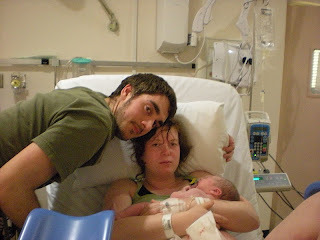 It was sort of reassuring that she was from Wales, considering that is where the baby was conceived! Anyway she realised that I hadn't been for a wee in a long long time, so gave me a catheter, and I filled so many pots, about 2 pints worth! It was such a strange feeling! so it got to about 9pm and they examined me again, I think I was about 6 cms, but again my cervix was really thin. The midwife was quite pleased with the progress and didn't think it would take that much longer, she said she would be suprised if I went over 1am. I had about 3 top ups on my epidural but was still getting pains on my sides. I was getting so uncomfortable, my legs were all pins and needley and if i was lying on my side my belly really hurt on that side. I couldn't really lie on my back because the baby was crushing my lungs. I was getting pretty annoyed at the end. I had the shivers really bad, and couldn't stop shaking, but was really hot. It was pretty scary how tired my body was. They examined me again at 12 and I was very nearly dilated, only a little bit covering the entrance. They gave me another hour or so to wait and see and then checked me again. I think they checked me again about 1.30ish and I was fully dilated. The midwife said that I could try and push for 15 minutes and see if the baby moved down. If the baby didn't move then I would have to wait another hour to start pushing properly. By this time it was nearly 2am, and the thought of waiting another hour just wasn't an option, so I got really determined and just started pushing. 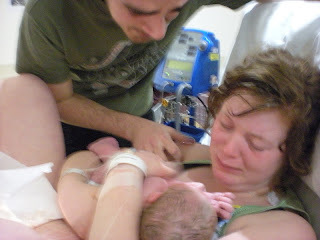 By this point I could feel the contractions again, so I knew when to push, I just couldn't feel anything down below as it was completely numb. I think I started pushing just before 2. Pushing the baby out is the hardest and weirdest thing I have ever done. I was lying on my back with my legs in stirrups, the most undignified position ever. Rob was on my left and my mum was on my right, and I had to hold my legs with my arms. They kept on saying push into your bum, which when you can't feel your bum is a pretty hard thing to do. Every contraction I got I had to take the deepest breathe, put my chin on my chest and push really really really hard, I couldn't even make a sound because I was so concentrated on pushing. I had to do 3 pushes every contraction, and by the last one I was so exhausted. My contractions were coming pretty close together so I didn't have much of a chance to recover before I had to start pushing again. She said she could see the head, and I kept on asking how many more pushes it would take, and how much longer. She was really good with me, and I was a bit scared of her, and wanted to do well for her. Because I had been on the epidural I wasn't allowed to eat, but had been drinking an energy drink that was bright blue, and at one point during pushing I had the urge to be sick. 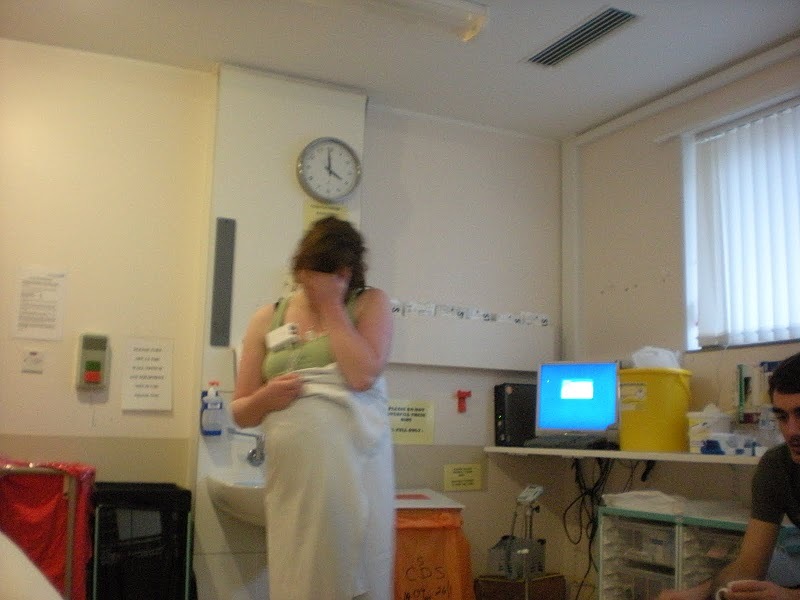 I said "I'm going to be sick" and a split second later I was projectile vomiting bright green liquid over myself, and nearly hitting the midwife between my legs and my Mum and Rob, it was pretty funny! But horrid at the time, I just kept on being sick! Rob had a flannel for my forehead and I kept on asking him to make it wetter and wetter until it was soaking and I had water pouring over my face, but it was so nice as I was so hot and straining really hard! Other than me asking rather sternly for more water I think I was pretty good. I didn't make much racket, and didn't really swear or call Rob bad things. I think I was fairly under control! So I pushed for about half an hour, when he crowned I felt his head come out, and was really freaked out because his head was a triangle shape and not round! Rob and my mum saw everything! I remember his head coming out finally, then had a few more pushes and his body came sliding out. It felt this massive gush and release when he did. It was such an amazing but strange feeling. 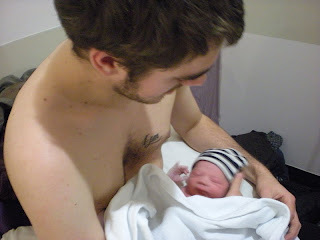 They put him on my chest straight away, and all I can remember saying is "baby, its a baby" and "he's got massive hands" I was really overwhelmed and couldn't really believe that it was a baby and I had pushed him out. They took him away to rub him and check him over, then I heard him cry. 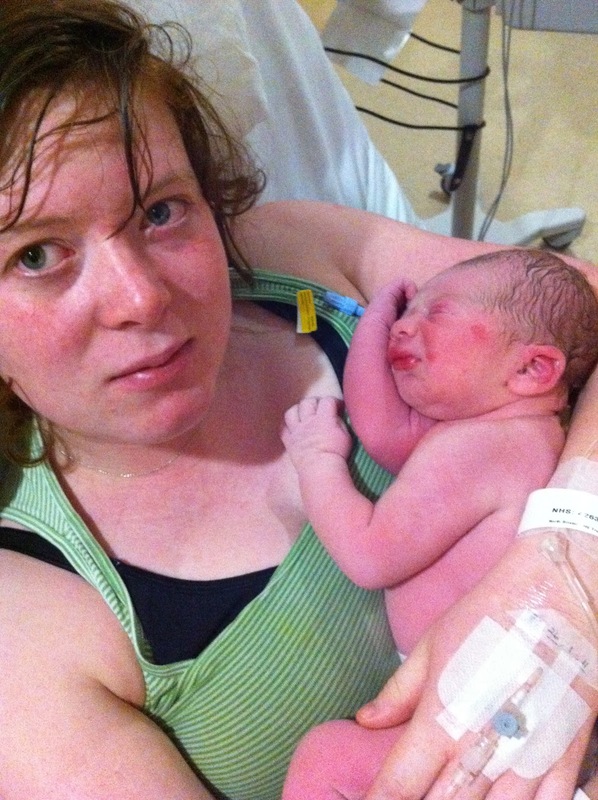 They had injected me for my placenta delivery, which only took 10 minutes, which was really weird to deliver. I felt more of a release, after a tiny bit of pushing, then saw this weird red bloody jelly fish thing come out and be put on the table. They wrapped him up and put him back on my chest, where I was sick again. I was so out of it by that point. They gave me an anti-sickness drug, which made everything go spacey and dreamlike. I couldn't focus on people and nothing seemed real. I remember Rob crying and my mum too, but I don't think I did. I think I was too exhausted. I apparently spoke to my sister, but I don't remember that! Rob then had skin to skin with him and I fell asleep. After about an hour I woke up again and I had proper skin to skin with him and fed him. It was such an amazing feeling, but I was half asleep and still out of it. It was went so fast! I wish I wasn't so exhausted so I could be more aware of what was happening! But I was really proud of myself for pushing him out and so was everyone else! Rob was so completely loved up and was really really proud of me, so was my mum. I had to have some stitches but again I don't really remember that happening. My mum said that it looked like a tailor sewing a dress when the midwife was stitching me up! 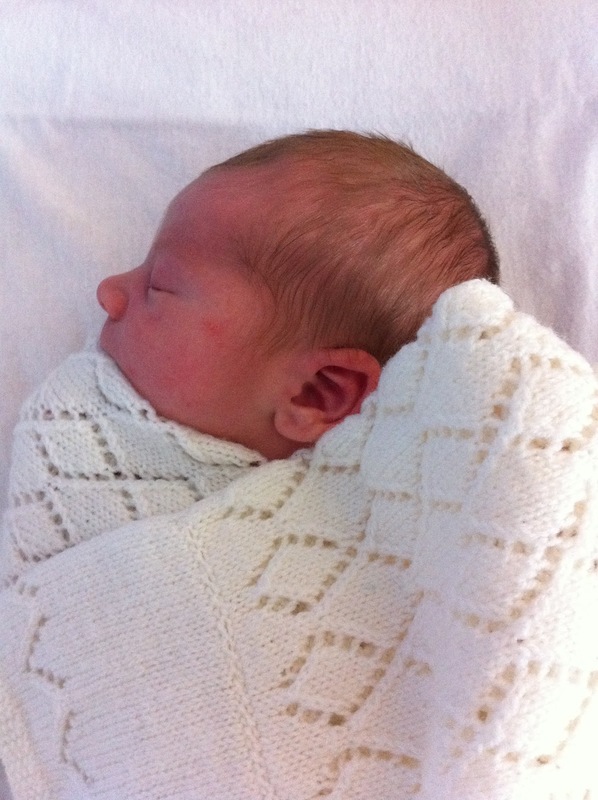 I think my mum got to have a hold after I fed him, but then they had to leave before I could be moved to the ward. I was cleaned up my the nurses and brushed my teeth and put on a nighty, and felt a lot better. I just needed to sleep. 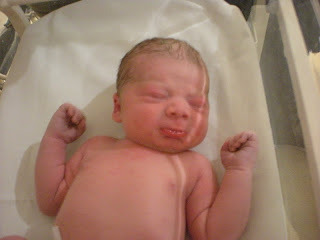 I think my mum and Rob left at about 5, and I slept for an hour before being moved up to the ward. So that's where I shall leave it! I will post more pictures tomorrow of his first few days! It's pretty nice to remember all of this, it was such an amazing experience, and it already feels so long ago. It is definitely the best thing I have ever done, and I am pretty proud of myself! 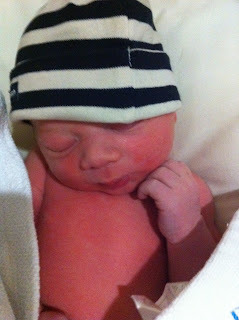 p.s We couldn't think of a name straight away, as he didn't seem like an Arther or Ethan. So he was just Baby boy Oliver.